This feel good story is warming our hearts. Fred Barley, a 19-year-old biology major from Georgia is the true definition of the word perseverance. With goals to pursue a career as a medical doctor, completing his undergraduate education is a top priority and a lofty goal to attain. However, he refused to let adversity with homelessness and unemployment stand in his way. He instead set out on a six-hour ride on his little brother's bike from Conyers to Barnesville, GA, with only two duffel bags and two gallons of water in tow. Upon his arrival, he set up camp in a tent on his college campus, Gordon State College, to ensure he would be able to prepare for class registration in August. His first few days were spent searching for employment during the day and seeking refuge at night, with nothing more than a box of cereal to carry him over. But Barley's plans took a huge turn for the better when he was startled Saturday evening at the sight of two police officers outside of his tent. The officers, responding to a call of someone sleeping on campus, immediately sensed that something was awry and began listening to Barley's story. Upon hearing Barley's goals and what he was doing to reach them, the officers were compelled to act. They took Barley to a local motel and paid for his next two nights. Then a wife of one of the officers took the act of kindness a step further by posting Barley's story on a Barnesville Community Facebook page. From there, a GoFundMe was created to help Barley pay for his college expenses and in just a few days it's raised over $67,000. “The stuff that’s happening with police officers, I am black and he didn’t care what color I was. He just helped me, and that meant a lot,” Barley said to WSB-TV in Atlanta. Photo: WSB-TV Comments and donations poured in from across the country as people were inspired by Barley's tenacity and strength to achieve and conquer higher education. 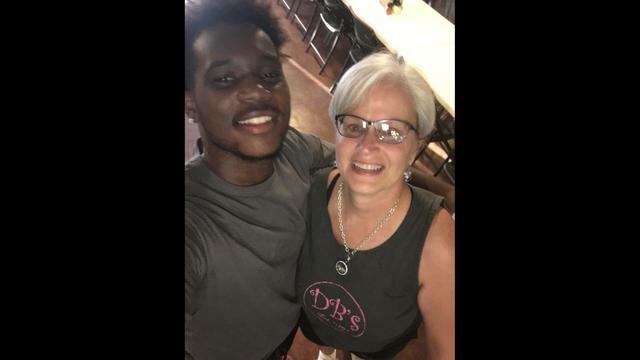 Local pizza shop owner, Debbie Adamson, has given Barley a job and has committed to working around Barley's school schedule to allow him to work and help in any way she can. Donations of clothing, school supplies, medical & dental needs, shoes, a new bike, and possibly a new car are coming into fruition to help Barley succeed even more. In this video on Facebook, Barley emotionally expressed his gratitude to all that have supported him and have donated to help him reach his goals. “The Bible says, ‘You can do all things through Christ who strengthens me,’ so I know I can,” he said. “My legs are working. Millions of people walk and bike to work every day. I definitely think I can bike a couple hours to get to my future.” In the midst of struggle and tough circumstances, we find the true measure of our ability to hold on and keep going despite whatever obstacles are in our way. Fred's story of doing whatever it takes despite those circumstances is a testament to how important it is to stay committed to our goals and how the goodness of others is never to be forsaken. Photo: giphy Have you ever been blessed to with a random act of kindness similar to Fred's story? Share your story in the comments. Never miss an update. Sign up for Blavity’s daily newsletter.